A big sherry dram with a hint of smoke, that could well be a Springbank. A few drops of water help to bring out the nose and taste and enhances the rich finish. A great whisky with fantastic nose, delicious taste and great finish. For an absolute Top Whisky is still missing some balance, because the taste can not quite keep up with the flavor. I would advise against water, as the Kilkerran flattens quite a bit. After giving the whisky about 30 minutes to breathe, the first impression of the aroma is simply terrific. The sherry and the smoke of Kilkerran harmonize perfectly: Milk chocolate, raisins, blood orange, Longrow-like smoke, the slightly musty aroma of Springbank and a seasoning of gravy, syrup and maggi give a bombastic, but round overall picture. With water are still cream candies à la Werthers genuine added. Without water, the whisky tastes slightly dry with lots of sweetness from prunes, dark grapes, tender-bitter chocolate and coffee. The smoke has almost completely disappeared. After adding a little water add some acid and the chocolate is strengthened. It takes the whisky but also something the body. A very long finish paired with a mix of sweet and slightly sour aromas of honey, nuts and dry sherry. 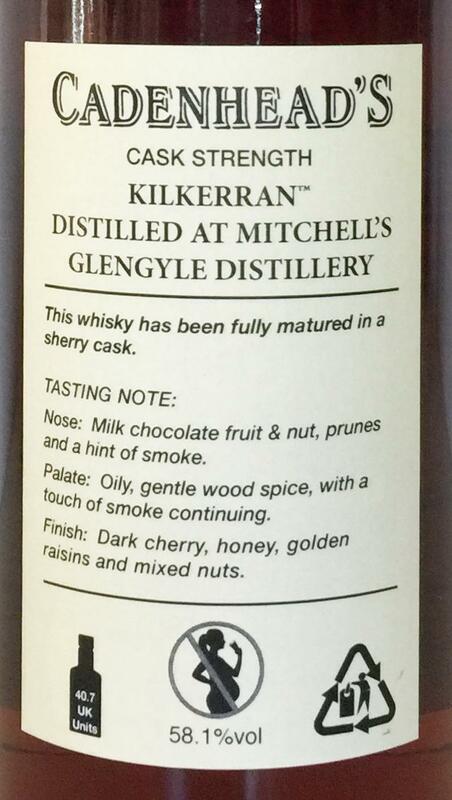 OK, the first ever single cask bottling of Kilkerran, and sherry cask! High expectation then. In my humble opinion, this is a modern sherry whisky with overly dark characters. Not to my liking. Medium, sherry characters, plums. Not an easy dram. Some milk chocolate fruit and nut found, prunes swell, and a hint smoke. Oily, gentle wood spices, touch of smoke continuing. raisins and some mixed nuts. 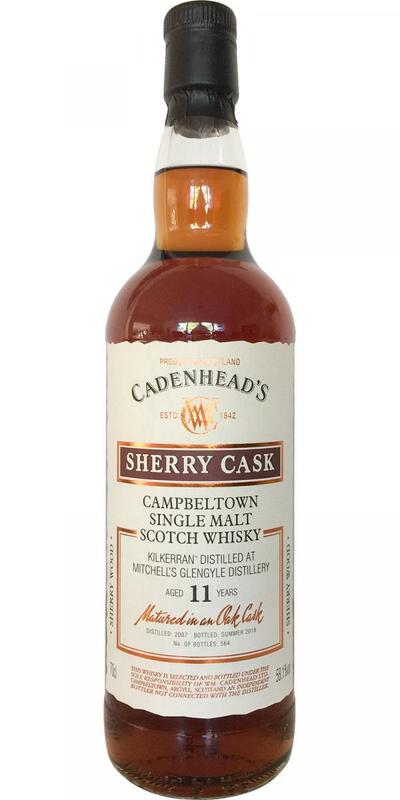 Excellent sherried single cask, very close to Springbank. 88/89. Sherry, bacon, smoke, cocoa, blood orange, waxy fruits, salted caramel, lacquered wood and ash. Powerful, oily and creamy. Dried fruits, honey, tannic oak, cocoa and herbals.